1. How do you feel about FAQ pages? Funny you should ask. I’m not a big fan. With very few exceptions, including an FAQ on your site map or your website is a sign that something is wrong with your content strategy. 2. Don’t FAQ pages add value to a website? Not really. Most FAQ pages function as the junk drawer of a website — a random collection of little odds and ends that you couldn’t figure out what to do with. And, in many cases, they’re the result of having a poorly structured website. 3. But if I know my audience is asking certain questions, shouldn’t I put that information on my website? Yes, absolutely. But that doesn’t mean you need an FAQ page. If you know the questions your audience is asking, write content that actually provides the answers. 4. But we’ve always had an FAQ page! I know! Who hasn’t #amiright? But that’s not a good enough reason to keep it. Also, that’s not a question. Look, if your content isn’t answering your audience’s questions, then you need to work on your content. This typically means one of two things: Either the content itself needs to be reworked so it better addresses your audience, or things are just too hard to find. 5. Ugh, fine. Then what should I do with all these FAQs? Use them as a guide for revising your content. Really, don’t feel bad about having FAQs — they show that you know what your audience wants or needs, which is very important. 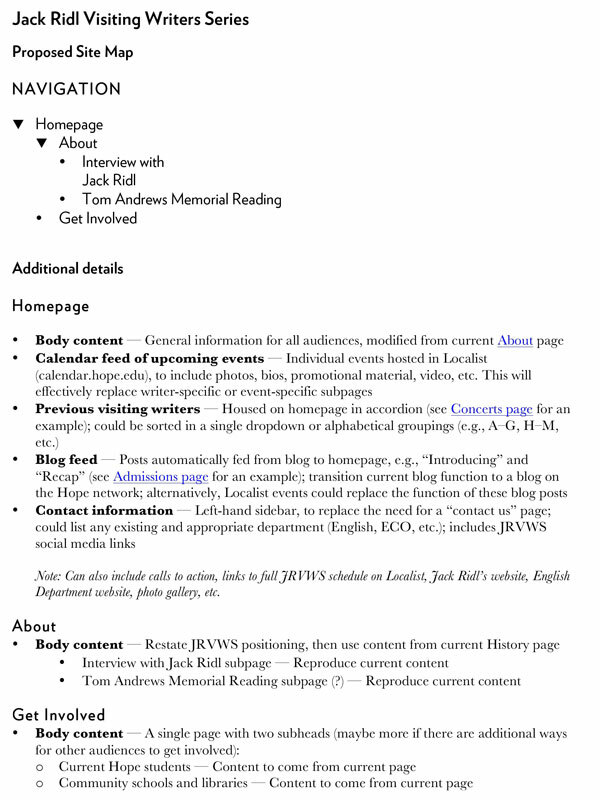 Now take that information and use it to inform your content throughout the entire site. 6. How do I do that? Go through your FAQs and identify which parts of the website are most closely related to each question. For example, if you keep getting asked about a registration process, make sure that information is clearly spelled out on your Register page. Or maybe people can’t easily find your Register page, so you need to rethink your navigation and hierarchy. In any case, once you’ve put the information in a place that makes sense, delete the question. 7. Okay, I used my FAQs to revise my content, and now I don’t have any questions left on my page. Now what? Good! Now we can delete your FAQ page. With the fall semester nearly behind us, it’s time to get ready for working on your websites in the spring semester. New dates for both OU Campus User Training and Writing for the Web are now available — please sign up below using the links below. Although it may not seem like much has been happening since our big web launch this past summer, we’ve been hard at work behind the scenes. This past semester, we’ve provided content management system training to more than 75 people representing more than 50 departments, offices and programs. The new Department of History website was the first to launch, and there’s a growing queue of others that will be launching soon — several before the end of December. And we continue to provide support and assistance for people throughout campus. It’s been exciting to see the progress! These two-hour sessions will provide an introduction to our content management system, OU Campus, and will give users hands-on training in creating and editing web pages. User training is required for everyone in your department who will be performing hands-on maintenance of your website. However, space is limited to 20 computers per session; groups from the same department or office will be asked to share a workstation. Please limit the number of people from your department or office to three or fewer. Monday, February 15, 3–5 p.m.
Wednesday, April 20, 3–5 p.m.
We’ve received a handful of questions about site maps — the third element in our requirements to officially kick off your office or department’s site construction — so I thought I’d take a minute to explain a little bit more about what we’re looking for. It may help to think about this as a file structure. Identify the files you’re putting information in, and do it in a way that will help first-time users find what they’re looking for. Put pages in clearly labeled folders. You’ll want to be able to account for where all of your content goes, but that doesn’t mean every piece of content has to be shown on your site map. Clarifying details aren’t bad — in fact, they’re quite good — but you should leave them out of your navigation. In our scholarship example from number 1 above, there’s no need to actually list the names of your scholarships in your site map. If it’s important to identify them, put them on page two. You should end up with an at-a-glance, high-level view of the structure of your website. Make it easy to read, clean and clear. Make each page a bullet; make each child page a sub-bullet. At the end of this process, we want a map that can be used as a blueprint for building individual pages. If it’s listed on the map, it becomes a page. 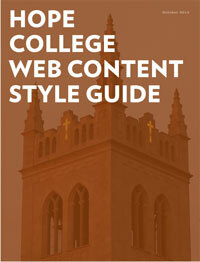 Download the Hope College Web Content Style Guide. We’ve all been there: You’re working on your department website and you can’t remember how to spell that building name. And is it the Philosophy Department or the Department of Philosophy? How do I make one of those backward-facing apostrophes for taking the 1 and the 9 out of Class of 1996? What numbers do I spell out instead of using a numeral, anyway? Do I use a comma in this list? Until now, Hope College has just kind of winged it (wung it?). Every department and office has done its own thing, which is exactly what you’d expect; there hasn’t been a standard style that would allow users from all across campus to write in a unified voice. It’s one of the reasons the content on our old site has been sort of all over the place. But when we write for our department or office, we’re really writing for Hope College. The style we use is an important part of our brand. So Public Affairs and Marketing has put together a Web Content Style Guide for Hope that will help answer your questions and ensure that every part of the website is using a consistent style. We’ll be adding to and expanding this guide, and we’ll make new files available regularly. Of course, we encourage you to print a copy and have it within easy reach whenever you sit down to write for the Hope College website. 1. Grammar and style are practical ways of loving your neighbor. As Christians, we’re called to love our neighbors (Leviticus 19:18). It’s one of the great commandments (Matthew 22:39, Mark 12:31). And one important way to love our neighbor is to make sure that when we speak to her, we do so in a way that she understands. To communicate with a person in a manner that is difficult or impossible to understand is an unloving act. It puts a high priority on grammatical standards. Words, thoughts, sentences, paragraphs — yes, web content — should behave in expected ways that reinforce common conventions and meaning. I can’t put a comma at the end of a sentence and expect my reader to behave as if it’s a period. Shared rules of grammar exist to help make meaning clear. It places a higher priority on our reader’s ability to comprehend than on obeying every jot and tittle of the rules of grammar. This isn’t grammatical legalism. If your content is grammatically correct but difficult for your reader to understand, then you owe it to him as an act of Christian love to bend the rules of grammar — including those rules in the Hope College style guide — so he better understands you. 2. Grammar and style are questions of manners, not morals. I speak differently to my grandmother — more politely, with greater deference and propriety — than to, say, my friends while we’re out on the town. In the same way, there is a time and a place to be a little more proper with our style and grammar (I’m thinking of formal communications, letters to the Board of Trustees, emails to President Knapp) than in other places (e.g., emails to coworkers, blog posts like this one). It’s bad form to show up at a black-tie event wearing your swim trunks, flip-flops and a hoodie. But it’s equally bad form to show up at the neighborhood block party and pig roast in a three-piece suit. The question isn’t right or wrong; it’s appropriate or inappropriate — and answering that question depends largely on considerations that can’t be addressed by Mssrs. Strunk, White and Webster. Know your audience, tailor your style in a way that is respectful to your audience and appropriate to your environment, and make your meaning clear. All grammar and style hangs on these commandments. Ready to start working on your department or office website? So are we! This month, we will begin connecting with every area of the college to plan, build and launch new sections of the website throughout the academic year. User training is required for everyone in your department who will be performing hands-on maintenance of your website. However, space is limited to 20 computers per session; groups from the same department or office will be asked to share a workstation. UPDATE: Fall registration is now closed. Additional training sessions will be available monthly in the spring semester. Tuesday, October 13, 1–2 p.m.
Monday, November 2, 2–3 p.m. Both trainings will take place in DeWitt Herrick Room. Additional sessions will be available in the spring semester. Site maps will be discussed during the Writing for the Web training. A content checklist is available for departments and offices to begin planning. Once you’ve completed the first three steps, let us know! We’ll schedule a meeting to review your site map, answer any questions and begin building your website. Thanks, and please let us know if you have any questions! 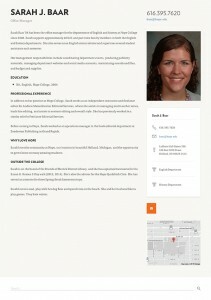 Hope College has awesome people, and we want to tell their stories. All 768 of them. When planning the new website, we made sure it would showcase the great programs, facilities and students at Hope—but we also wanted to make sure we’re highlighting one of our greatest assets: The faculty and staff who make this community come alive. We want our faculty and staff information to be accurate and up-to-date when we launch. Most of the specifics (name, title, photo and contact information) will be automatically generated from our database, but we also plan to include a brief write-up that provides additional information about our people and their roles at Hope. If you work at Hope College—full-time, part-time, faculty, staff, administration, whatever—please take some time to fill out the secure forms below. Or, you can email your information, bio, CV or a draft to Josh Bishop. We’ll likely edit all submissions for consistency and style. If we have any follow-up questions, we’ll contact you. Don’t hesitate to get a hold of us if you have any questions. We kicked off our Writing for the Web training today with the first of many presentations. More than 40 people attended (of the more than 100 who signed up), and we’re thrilled to see such an enthusiastic response from faculty and staff on campus. Print versions of the Web Content Guidelines, Brand Quick Start Guide and the full Brand Guidelines are available from Public Affairs and Marketing. Just let us know what you need. The team here at Public Affairs and Marketing is excited to launch a new training session, Writing for the Web. One thing we heard from the beginning of the website planning process is that many people on campus would like additional support for writing, editing and updating their department or office website. Some of you feel like you’re out there all alone, working without the tools and resources you need. We’re going to change that with a series of training and support sessions available for everyone who works on the Hope website. We’ll also discuss such topics as identifying and writing for your audience(s), as well as how users read web content (hint: they usually don’t)—and why that matters for how you write. Plus, we’ll make available tools that will let you hit the ground running as soon as you’re ready to work on your new web content. Thursday, March 19, 11 a.m.
Tuesday, March 24, 10 a.m.
Wednesday, March 25, 3 p.m.
RSVP today for one of the trainings. All of them will be held in the Herrick Room. Can’t make it? No worries: We’ll be repeating the session on a regular basis for those who can’t attend in March. Writing for the Web is the first of many training sessions we’re planning for the web content community here at Hope. Stay tuned for more information on other sessions, including an OU Campus user’s guide.